Sam Milby says about his Hollywood dream: "Sa Hollywood, grabe ang competition doon... Lahat ng big stars sa States, nag-o-audition rin sila for roles. It’s a part of it." 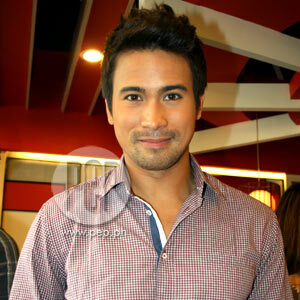 Sam Milby feels blessed with the milestones in his career this 2011. Recently, a public announcement was made that his previous show with Maja Salvador, Impostor, is the lone Filipino series nominated in the Telenovela category of the International Emmy Awards. In an interview held earlier today, October 7, at the Rai Rai Ken restaurant at SM North Edsa, Sam says about this honor: "Thankful talaga. I would never expect anything like that, nomination pa lang, happy na ako...kaming lahat." What does he think the edge of Impostor is over other nominees? He points out, "Siyempre, maganda ang story and Maja did a great job. "Dalawang characters ang ginawa niya. She acted like Melai [Cantiveros]... Maja really carried the show." Aside from Sam and Maja, Impostor also stars real-life couple Melai Cantiveros and Jason Francisco. ALTA. According to Sam, he has yet to start taping for ABS-CBN’s upcoming TV series, Alta. He also revealed that he will start shooting his movie with Bea Alonzo this year, and he is slated to work with Eugene Domingo for another movie next year. Of his movie with Bea, he says, "Ang rinig ko, si Direk Olive Lamasan ang director ng movie." "Dapat mag-start na kami ng movie ni Bea either next month or sa December." PURSUING HIS HOLLYWOOD DREAM. Sam says that working in Hollywood has always been his dream. He names Leonardo DiCaprio, Edward Norton, and Sean Penn as his idols. "I’d like to follow in their footsteps, but they started a lot younger," says the actor, who started his showbiz career when he joined Pinoy Big Brother in 2005. Sam is scheduled to go to New Jersey tomorrow, October 8, for his upcoming show at the Six Flags Magic Mountain theme park. "May meeting ako sa Monday, habang nandun ako sa New Jersey. "Actually, I have four meetings on Monday." He later adds, "There are three agencies that I’ll be meeting." Sam recalls how he caught the attention of the network executives in the United States. "They were looking for Asians and they watched the Star Magic Tour earlier this year in L.A.
"They had other agents watch me in New York and they asked me to come back to audition. "I did audition for one of the biggest networks over there, and it was just down to two of us. "Korean yung isa ’coz the network is looking for an Asian-looking [actor]. "But I found out that the show actually ended up being in another network. But the network is really helping out a lot." Sam believes in grabbing the opportunities that come his way. "I have a good feeling and it’s hopeful naman." If he is blessed enough to make it in Hollywood, Sam plans to stay in the United States for just three to six months. "That’s going to be next year, so ang Alta and the movie, tapos na kung sakaling may work ako doon." WORKING WITH MARIE DIGBY. For his latest album called Be Mine, Sam had the chance to work with Marie Digby, who was romantically linked to him in the past. But he says about the American-Japanese singer, "Starting last year, we’ve been good friends." He says that they already shot their music video for their duet titled "Your Love." "Nag-shoot kami ng video kahapon. It was nice to see her actually kasi, siyempre, fan ako. "Mga videos niya sa YouTube, I’ve been watching them ever since and to be actually be in a video with her, it’s nice." Since the title of his album is Be Mine, members of the press teasingly asked Sam if there was anyone special he could say those words to. The singer-actor, who clearly has learned more Tagalog since he arrived, replied with a smile, "Para sa babaeng nakalaan sa akin."